G3 constructed a loop track at the Pasqua elevator to handle the HEP trains. The fast-loading loop track means the railroad can keep locomotives attached to the train during loading and more quickly launch the train after loading is complete, CP officials said in a press release. 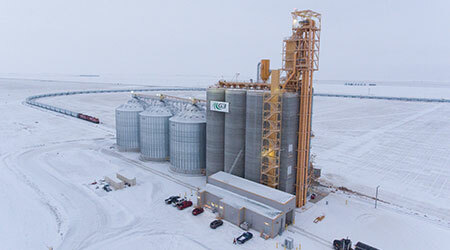 “As [we] continue to take delivery of new rail cars and elevator operators expand their facilities to handle 8,500-foot trains, this HEP train will become the new gold standard — driving further efficiencies for farmers, shippers and the entire grain supply chain,” said Joan Hardy, CP's vice president of sales and marketing-grain and fertilizers. The hopper cars are part of a half-billion-dollar investment CP is making to upgrade its grain car fleet. By year’s end, the Class I will have about 500 new hoppers in service — a number that’s expected to grow to 1,000 by spring 2019. Over the next four years, CP plans to purchase 5,900 new hoppers. CP also announced yesterday that November was another strong month for its carloads of western Canadian grain and grain products. The Class I broke its previous record for carloads shipped to the Port of Vancouver in a single month. In November, CP moved more than 17,150 carloads of Canadian grain and products to Vancouver, for a total of 1.54 million metric tons (MMT). Last month, CP announced October was the company's best month ever for grain and grain products shipments overall at 2.64 MMT. CP's grain and grain products shipments in November reached 2.5 MMT. Since the fall harvest push started in September, CP has moved 2 percent more grain and grain products compared with the same period last year.